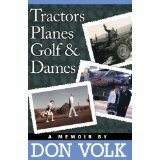 ***AUTHOR GERI AHEARN'S BOOK REVIEWS***: ~~Welcome DON VOLK~~Author of: "TRACTORS PLANES GOLF & DAMES"
~~Welcome DON VOLK~~Author of: "TRACTORS PLANES GOLF & DAMES"
Don grew up as an average person on his parent's farm in Utah, where he was taught to accept responsibility, be honest. He was also taught to do the best he could in work, school, and personality. He served his country through three wars: World War II, Korea, and Vietnam. He retired from the U.S. Air Force, after nearly twenty-four years of service. Don served over thirty years as a club Golf Professional with the PGA of America, and now holds a lifetime membership. Most importantly, he talks openly about his love for his wife Petie, who has passed away. The care he gave his girlfriend Sandy, up to time of her death and the love of his second wife Wandi, who gives him lots of hope for his future.